George Raymond Richard Martin, sometimes referred to as GRRM, is an American screenwriter and author of fantasy, horror, and science fiction. 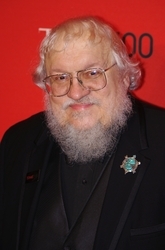 He is best known for A Song of Ice and Fire, his bestselling series of epic fantasy novels that HBO adapted for their dramatic series Game of Thrones. Martin was selected by Time magazine as one of the "2011 Time 100", a list of the "most influential people in the world".